Beehive Installation Assistance | Award-Winning Local Honey From OKC! Are you a New Beekeeper Who Needs Assistance Installing Your First Beehive? If you are and reading this for the first time, you might be thinking what is a package of bees and what is a nuc? Well, read on to find out what these are and how we can help you install them into your first beehive! 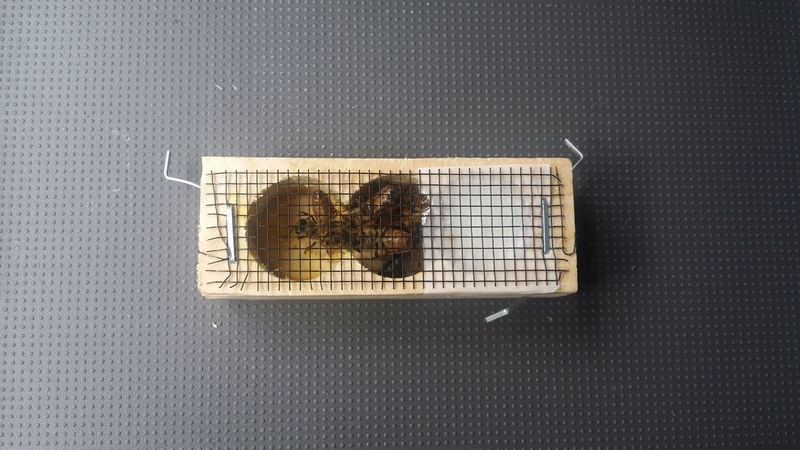 Package of Bees – This is a wooden box with a screen on two sides that is filled with 3 lbs. of bees (that may or may not be related). It comes with a queen inside a queen cage along with several attendants inside it to feed and care for her. And, there is a can of sugar syrup with holes poked in it that allows the syrup to slowly drip out so that the bees are able to eat until they arrive at their new home. Packages of bees typically arrive in April (in Oklahoma…..this might be different in other places). They need to be installed into your beehive fairly quickly so that they don’t run out of food. Nuc of Bees – This is a mini-hive and is pronounced with a long ‘oo’ sound like ‘duke’ with an ‘n’. (The one at right has had the lid removed so you can see inside it.) It is a small wooden or cardboard box that is about half the size of a deep brood box. It contains 3 to 6 frames of built out comb. About half of these frames will be solid capped honey, and the other half will be brood. The nuc will contain about 3 lbs. of bees as well as a queen inside a queen cage along with several attendants inside it to feed and care for her. The queen may or may not have already been released by the time you receive the nuc. Nucs typically arrive in mid- to late May (in Oklahoma….this might be different in other places). Keep these boxes, as they make excellent swarm catching devices. They can also be turned into a mini beehive if you decide to do a split with a beehive that has gotten so large it is busting at the seams. If you need help installing your bees once you get them, we can install the honey bee colony for you, and ensure that the hive has been installed properly. You will need to provide the honey bees which you should have ordered through another beekeeper, a local bee supplier, online, or via a vendor listed in the Bee Journal. 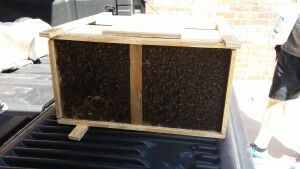 One deep hive box into which we will install the bees. It needs to have 10 frames in it with either wax or plastic foundation already installed into them. Some vendors sell these together with the hive box and others sell the frames separately. So, make sure you know what you are ordering. Some sort of feeder – this can be a small hive feeder that attaches to the front door of the hive or it can be a hive top feeder. Sugar water already prepared in a 1:1 ratio to put inside the feeder. Some sort of hive stand to put your bees on. This can be as simple as 4 concrete blocks, or 2 concrete blocks on each end with a couple of 2×12 boards set across the top of them to set the hive(s) on top. We can help you pick a good location on your property for your bees that will work best for you, your neighbors, and for the bees. 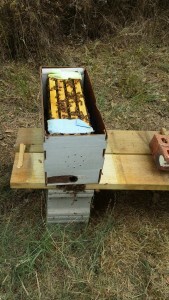 We can help you make sure your hive stand is setup properly with stability. We will install the bees for you. 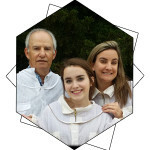 We will show you how to feed the bees and add more sugar water. We will show you how to do your next maintenance check in several days when you come back to make sure that the queen has been released from her cage. Queen Bee Cage with Attendents – Notice the sugar cube on the right blocking the exit. Bees will chew through this from inside the hive to let her out. We cannot guarantee that your bees will not swarm or die. Due to all of the pesticides out there these days, at any time your bees can get into something that has been fumigated or dusted and bring it back to the hive, potentially killing the entire hive. Swarming is also something that sometimes happens after bees are installed. Feeding them is the best way to prevent this, but we cannot guarantee that they will not swarm. This is a risk that every new beekeeper takes when they get into the hobby. Prices start at $25 per hive installation and go up depending on the distance from our location to yours. This is to cover our drive time and gas to get to your location. 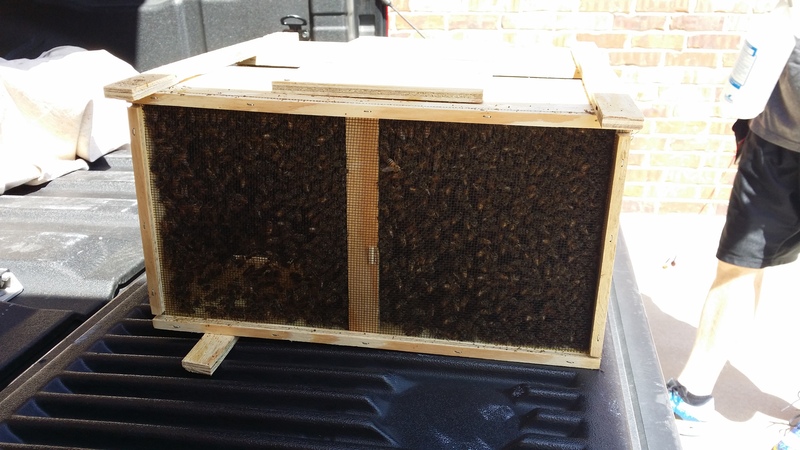 If you are interested in having us help you install your bees for you and show you how to do your first maintenance check, call us at (405) 314-8175!